Texas Gov. 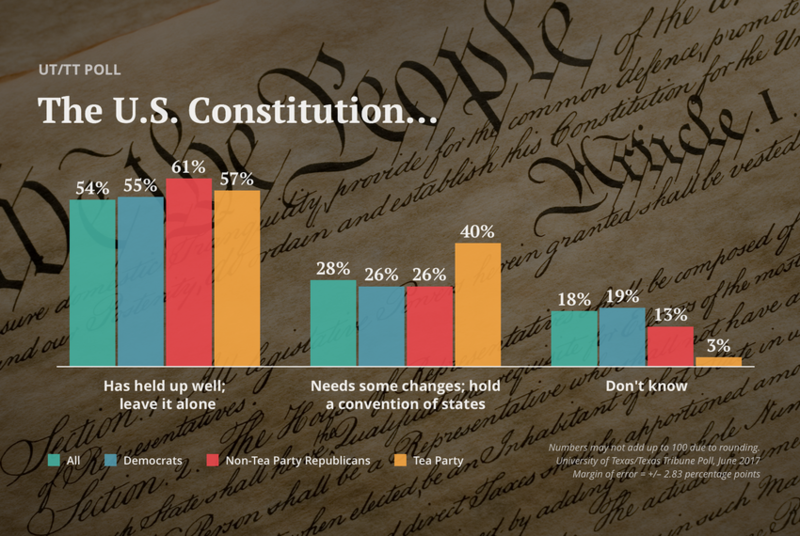 Greg Abbott wants a convention of states to consider amendments to the U.S. Constitution, but most Texas voters aren't convinced that's a good idea, according to the latest University of Texas/Texas Tribune Poll. Gov. Greg Abbott’s signature proposal to get the states together to revise the U.S. Constitution is a nonstarter with most Texas voters, according to the latest University of Texas/Texas Tribune Poll. Republicans were a bit more likely than Democrats to favor the status quo, but 40 percent of Tea Party Republicans agreed with Abbott’s proposal to “hold a convention of the states to consider amendments to the U.S. Constitution.” In that same group, however, 57 percent said they’d leave the Constitution alone. None of the subgroups in the poll — by race, ethnicity or party — sided with the governor. After years of talking about it, the Texas Legislature this year agreed to end straight-ticket, or one-punch voting — allowing voters to cast a ballot for all of a party’s candidates at once — in 2020. Politicians whose futures are decided at the ballot box seem to feel a little more strongly than voters do: 44 percent said one-punch voting is a good idea, while 34 percent said it’s a bad one. And though it was a Republican Legislature that opted to stop the practice, Republican voters like one-punch voting more than Democrats do. Among Republican voters, 54 percent called straight-ticket voting a good idea and 29 percent called it a bad one. Among Democrats, 41 percent favored it and 33 percent said it’s a bad idea. Confusion about the Texas voter ID laws that were in effect in last year’s elections led hundreds of registered voters to cast ballots even though they didn’t properly identify themselves, according to reporting by The Associated Press. Those voters signed affidavits saying they were eligible to vote and then failed to show their photo IDs later. In the UT/TT Poll, voters were split when asked whether such people should be penalized, with 40 percent saying yes and 38 percent saying no. Most of those who said a penalty should apply — 62 percent — said it should be a fine, like a traffic ticket. But 11 percent would recommend jail terms of less than two years and 7 percent would recommend jail terms of 10 years or less. A majority of Texas voters said the state government is a good model for other states to follow. That finding contrasts a bit with their assessments of the Texas Legislature: 34 percent approve of the job the Legislature has been doing, while 42 percent disapprove. In both instances, Republican voters were more likely than Democratic voters to give good grades to a government with a GOP majority. Among Republicans, 86 percent said the Texas government is a good model for other states; only 23 percent of Democrats agree with that. Likewise, only 8 percent approve of the Legislature’s work, while 63 percent of Republicans do. Most Texas voters said they “closely” followed the regular session of the Texas Legislature, but a much smaller fraction said they followed it “extremely closely.” Overall, 55 percent said they were watching; 11 percent “extremely closely.” The rest said they were not closely following the goings-on in Austin during the first five months of the year, including 12 percent who chose “not at all closely” when asked about their attentiveness.